Villingen-Schwenningen. The FREE FORCE by U-Turn is now available as “new edition” in a fresh, trendy design and the new U-Turn-claw. Furthermore, the canopy is now equipped with the newest Dyneema lines, which optimized extension behavior gives the glider an extra portion agility. 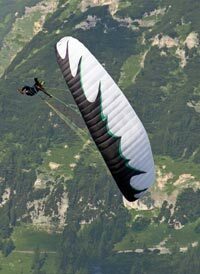 Therefore the very agile canopy is more than ever a must-have for those trying to practise acro-figures. With the new design the FREE FORCE appears even more dynamic. The FREE FORCE has the identical ground plan as its successful, elder brother G-FORCE, but its aspect ratio is so far subdued by the designer Ernst Strobl, that the conferral of the seal of quality was assured. There is even more: due to the employment of the automatic flight stabilisation (AFS) the canopy was awarded, despite tremendous performance in many fields, the safety of the DHV-assessment 1-2. "FREE FORCE stands for a lot of fun whilst flying. 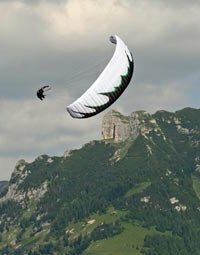 By means of the manoeuvrability and agility, similar to the G-FORCE, connected with safety supplies of the AFS, the FREE FORCE is the perfect glider for all those who want to start acro-gliding" Strobl marks an area of employment. At the same time the long-haul pilot can look forward to this first DHV-2 glider with AFS-system. Although the FREE FORCE has only a small cap, it craves for altitude in the thermal. With a top speed of more than 56 kilometres per hour one is very agile en route and the AFS-system makes sure with many little, automatic corrections that FREE-FORCE pilots always achieve the maximum altitude on trips. Of course there had been long discussions whether to employ the AFS-system in a DHV-2-wing or not when the new canopy was introduced. But now, after the prove of value, as expected, the AFS is still on board in the new edition. Because the system offers a lot of advantages. 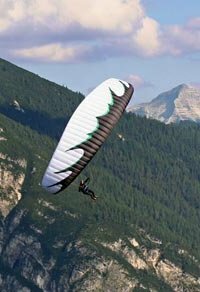 To talk about acro-gliding: The FREE FORCE is available in sizes 22, 24 and 26, and thanks to the ground plan that is identical to the G-Force, this canopy also goes about it with tremendous dynamics. Dynamic figures such as spirals and loops work in an easy way; here the unrivalled performance equipment is set to activate when and if required. "The AFS-system is not activated during dynamic manoeuvres, as the pressure inside the wing prevents an intervention" Strobl explains.